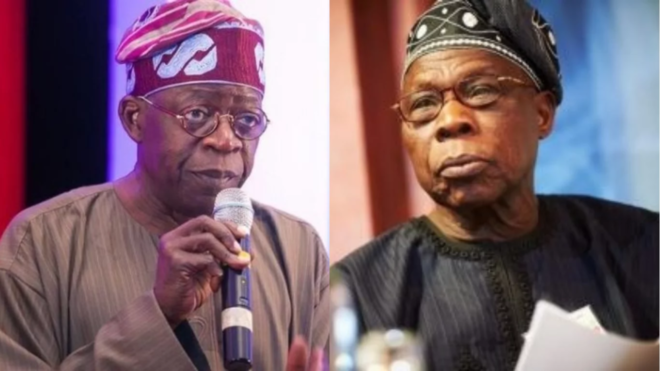 The National Leader of the All Progressive Congress (APC), Chief Bola Tinubu says former president, Olusegun Obasanjo does not have the right to complain about election rigging. This comes a day after the former Lagos State governor told the former Nigerian leader to shut up because he has expired in Nigerian Politics. OBJ had on Sunday, while addressing Nigerians on the state of the nation, renewed his political battle with President Muhammadu Buhari. He had asked the president not to seek re-election again, on account of incompetence, nepotism among others. In his Sunday’s address, he alleged that the president was planning to rig the forthcoming general election. Reacting in a statement titled ‘Chief Obasanjo – At War Against His Own Deeds’ on Tuesday, the APC top official said the Obasanjo has no right to complain about election rigging. He said this is because the former president is a known election rigger who rigs without peer. “What knocks Obasanjo off kilter is that he could not dictate the result in Osun. He told those in the PDP that he held sway in Osun and throughout the Southwest. They believed him. He led them to defeat notwithstanding the almost impossible voter turnout in PDP strongholds in that state. Obasanjo can only win an election when has the final say over the final vote tally. Otherwise, he is a troubled man,” the former governor said.